#SymphonyATL brings an inspiring public art experience to Peachtree Center Avenue. 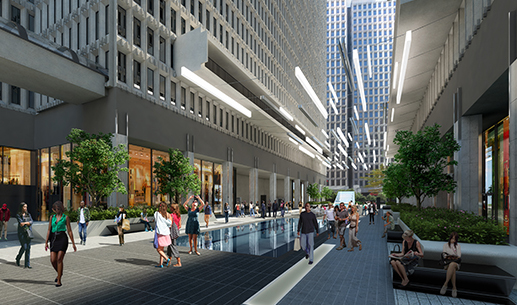 Massive updates and renovations to the main courtyard and common areas that will bring infusion of 21st century design, technology and artistry to Peachtree Center. Bright, modern, open spaces, primed for high tech and creative users. Over 50 vibrant shops, restaurants & services located on Peachtree Street between International and John Portman Boulevards. From the seasonal Green Market to on-site concerts, explore all there is to do, see and experience at Peachtree Center. Steps from Peachtree Center, you’ll find the city’s top attractions, entertainment venues, hotels and much more. The center of activity for Downtown Atlanta, Peachtree Center hosts a dedicated MARTA rail station, regional bus stops and generous on-site parking. A city-within-a-city. 2.3 million square feet of office space in 6 buildings. Over 50 vibrant restaurants and retail shops. Three world-class hotels with over 4,000 rooms. All interconnected by a unique series of skywalks that create an authentic urban experience. A place where time can be saved and savored and where productivity and quality of life go hand in hand. See it all right here. The Peachtree Center transformation into The Hub has officially begun. 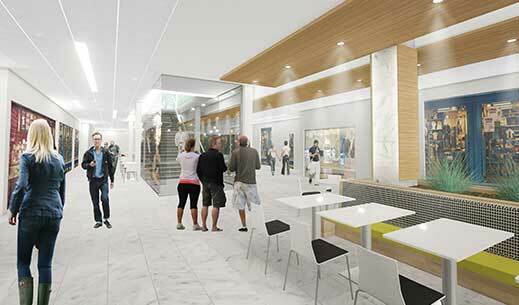 Massive renovations to common areas, both inside and out. A brilliant metamorphosis in the main courtyard and retail center. An infusion of light and an incorporation of technology. Architectural enhancements and infrastructure improvements. Exciting new eateries and experiences. A stunning rebirth that pays tribute to the past and embraces all the promise and potential of a fully modern workplace.